If you have the headroom, consider spreader and lifting beams. 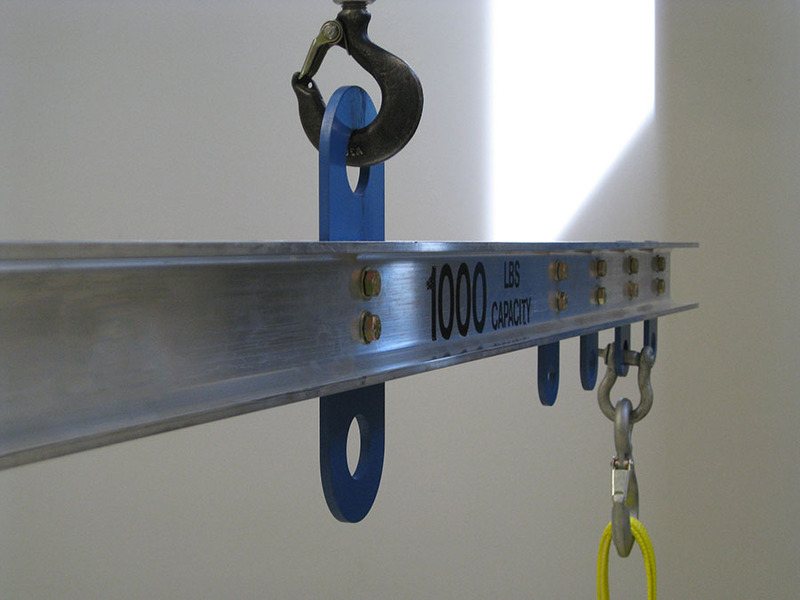 Lifting and spreader beams (AKA spreader bars) are below-the-hook lifting accessories for large, awkward or heavy loads. They distribute a load of a lift across more than one point, increasing stability during hoisting. You’ll see these being used when the object being lifted is too long to lift from a single point or when there is uneven weight distribution, such as long lengths of steel, bundles of raw steel, etc. There are three types of spreader configurations including spreader bars, spreader beams, and using multiple spreader bars stacked together. A spreader beam has two suspension points on the top leading to a single master ring in the center via slings. The slings coming off the top of the spreader to the crane angle up at a known angle (usually 45 degrees or 60 degrees). The lugs are orientated in such a way so that the majority of the load is purely compressive through the bar making it behave like a column. This is efficient structural loading scenario allows for spreader beams to support a great deal of load. Lifting beams have one attachment point on the top and multiple attachment points on the bottom. Modern manufacturing techniques have led to these beams coming in a variety of shapes and sizes. Spreader beams were originally I-beams with the lugs welded on the top and bottom but today’s engineered designs for spreader beams ensure optimal strength to weight ratios as well as being constructed of different materials. Being as the load is being supported directly beneath the suspension points the beam can be much smaller reducing cost and weight. They can be turned upside down to use two cranes to lift one object. This is a popular configuration if you are lifting something that exceeds the capacity of one crane and you don’t have access to a larger crane. If you are performing a complex large lift, you can use multiple spreader bars stacked on top of each other – to spread the load between more points. Not all workstations have the headroom to accommodate this type of arrangement; however, but if you do have the room, spreading the lift points stabilizes the load, distributes the load points to prevent bending of the load material, and allows for much more complicated load lifts. Since the weight of the spreader bar or beam is considered part of the load weight (effectively reducing your maximum weight limit of your hoist) there are many options to reduce weight if required. Other than steel, lightweight aluminium is also used, as are composite materials (which is a great option in electrical hazard locations as they are non-conductive). In Canada, spreader beams and bars are a required component of your annual inspection procedure by qualified inspectors (such as the ones at Acculift) to make sure they are fit for continued use (in the US spreader bars or spreader beams both fall under the ASME B30.20 below-the hook-lifting code).